In Simbirsk, Zon studied at the classical gymnasium. At this school, Alexander Kerensky’s father acted as director and Lenin was an older classmate. Later, Zon pursued studies in medical and natural sciences at the University of Kazan, graduating with a bachelor’s degree in comparative embryology. In his early life, Zon had a history of political agitation and subsequent imprisonment in his native land. While a student, Zon engaged in political activity, especially pressing for representative government in Russia, for which he was periodically arrested. Then briefly assigned to the international zoological station in Naples, he was investigated for helping to form the first trade union at Kazan in 1894. With the help of future Duma leader Alexis Aladin, Zon escaped his 11-year sentence of confinement. Inscribed: To Henry Schmitz*, May the School under your leadership grow and prosper. Raphael Zon, January 8, 1926. Fleeing westward, Zon studied natural sciences, political economy, and philosophy at universities in Belgium and London. In 1897, Zon arrived in New York City with a mere fifteen cents to his name. Zon soon left his temporary job at a drugstore for Ithaca, New York, where he enrolled in the nascent New York State College of Forestry at Cornell University. Studying under Bernhard E. Fernow and Filibert Roth, Zon earned his degree of forest engineer in 1901, becoming a member of the school’s first graduating class. On July 1, 1901, Zon entered the U. S. Forest Service as a student assistant assigned to forest investigations. Six years later, he was promoted to Chief of the Office of Silvics (later Forest Investigations). Zon made a persuasive and persistent case for separating research work from forest administration, achieved in 1915 with the establishment of the Branch of Research. Zon’s advocacy of research led to his organization of the first Federal Forest Experiment Stations and the Forest Products Laboratory. In order to advance the war effort, Woodrow Wilson appointed Zon to the National Research Council to study forest problems during World War I. In 1923, Zon left Washington, D.C., to accept appointment as director of the Lake States Forest Experiment Station at St. Paul, Minnesota, in 1923. In this position, Zon served with distinction until his retirement in 1944. Throughout his official career, Raphael Zon exercised a national influence on the development of forest research not surpassed by any other American forester. Pioneering studies of the relation of forests, streamflow, and flood control, Zon relayed his findings in his 1927 work, Forests and Water in the Light of Scientific Investigation. Initially attacked, Zon’s theories became widely accepted. Pinchot called Zon’s report “the most comprehensive and authoritative statement” on the topic. Forests and Water was reprinted and translated into several languages. Zon posing in front of map marking proposed shelterbelts. 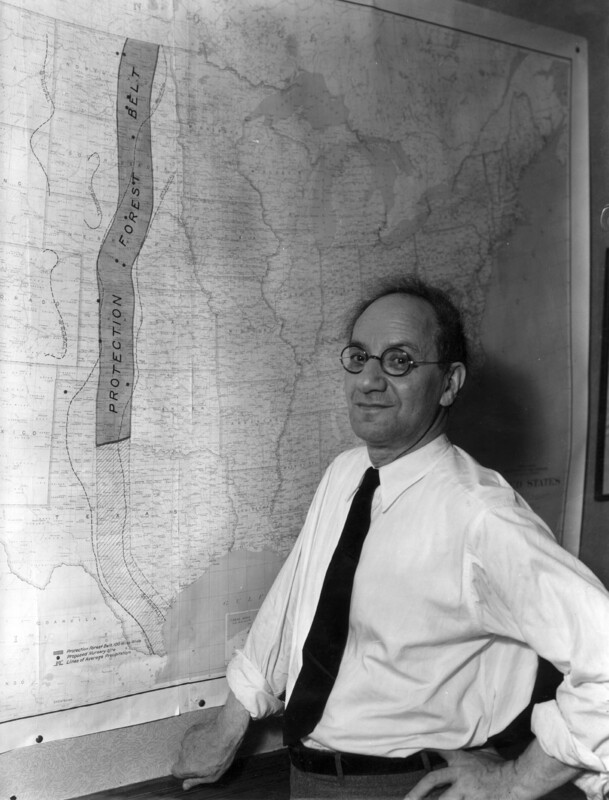 Zon faced early criticism with his engagement in another project: Franklin Roosevelt’s Great Plains drought relief program. In 1934, Congress funded a project to plant shelterbeds over 1.28 million acres, which purported to protect farmsteads from summer winds and winter blizzards. A shelterbelt enthusiast, Zon took a leadership role, helping to plan and monitor the project. Again, criticism gave way to broad approval. Dr. Zon made significant contributions to forestry literature. Many of his more than 200 scientific publications have been translated into Russian, French, German, and Japanese. With Bernard Fernow, Zon helped establish American forestry’s professional periodical literature. Zon’s connections began when he joined the editorial staff of the Forest Quarterly. He deepened his involvement, becoming editor of the Proceedings of the Society of American Foresters in 1905. When Forest Quarterly and Proceedings merged, Zon became one of the founders and the first managing editor of the combined publication, the Journal of Forestry. His tenure lasted until his resignation as editor-in-chief of the Journal of Forestry in May 1928. In one arena, though, Zon’s ideas failed to gain permanent acceptance. In the early 1930s, with the Great Depression bearing down on all including the timber industry, Zon joined fellow socialist Bob Marshall in pushing Gifford Pinchot to call on the federal government to take over all private timberlands as the only way to end the destructive logging practices and save the remaining private forests from degradation. While some of what they envisioned was partially realized with the passage of the Lumber Codes under the National Industry Recovery Act and through the Civilian Conservation Corps’ work, Zon’s radical stance divided the forestry profession. This and other controversies he stirred ensured his reputation as an agitator. Below, you will find one 3-page letter that addresses Zon’s missteps (with some loaded language) while also acknowledging his capabilities. From these fascinating and impassioned communiques and the Council’s analysis published in October 1934, one can understand why Zon has been labeled a gadfly. Even his detractors acknowledged his ability to spark debate! In 1940, Raphael Zon’s efforts were recognized beyond professional circles. In connection with the World’s Fair, Zon was named one of the 600 foreign-born citizens who were judged to have made the most notable contributions to American democracy within the past 100 years. Zon’s technical research and publications “covered the waterfront” of forestry. . . Not only as a searcher for forest facts, but as a scientist attuned to the human responsibilities of his profession, this Russian expatriate of inquiring mind and high standards deserves to be remembered in the annals of the U. S. Forest Service and of American forest history. To Raphael Zon, we say «С Днем Рождения» and thank you. Norman J. Schmaltz, Forest Researcher Raphael Zon, Journal of Forest History (January 1980), pp. 25-39. Norman J. Schmaltz, Forest Researcher Raphael Zon: Part 2, Journal of Forest History (April 1980), pp. 86-97. * Henry Schmitz was a professional forester and leader at the School of Forestry at the University of Idaho. on December 19, 2008 at 3:35 pm | Reply John D. Fox, Jr. I really appreciate the biographical information on Raphael Zon. In light of the current controversy over the role of humans in global climate change, perhaps Zon still has some relevance and good advice. I offer the following quote for readers to apply to contemporary debates as they see fit. By Raphael Zon, Director, Lake States Forest Experiment Station, United States Forest Service. He who explains is damned. I shall not, therefore, attempt, to explain my delay, beyond merely saying that the man who had the computation in hand left us and we had difficulty in getting him either to complete the work or turn over the data to someone else. I returned from my trip later than I expected and foolishly enough contracted a bad cold that laid me up for a couple of days. I am glad, however, to send at last the statement which I hope is still in time to serve the purpose which you had in mind. I am not in the habit of promising and not living up to the promise if I possibly can. You must, therefore, overlook our deliquency at this time. Digital copies have been made of these files, and it is my hope that they will be made available via the internet as the Forest Service expands its web presence with online data and metadata. Thank you for sharing, Laura. I look forward to the increased availability of such digitized materials of the Forest Service. Please keep us informed of any developments in expanded web resources! Wonderful picture of Zon standing beside the Shelterbelt zone. I had not seen this before. Although a member of the Forest History Society I had also not seen this blog before. Thanks. It might be helpful if you offered more details about what the society holds. Also, there are many boxes of Zon’s personal records at the Minnesota Historical Society. This is an important and inspiring article. One sad not is that there are still some deniers of deforestation having negative consequences for watersheds. I came upon such a study in a footnote while doing research to rescue the threatened David Dunlap Forest north of the City of Toronto. Typical of junk science the citation was poorly cited.